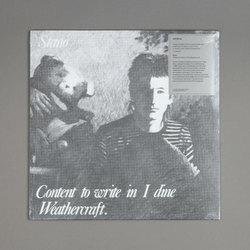 Stano - Content To Write in I Dine Weathercraft. Vinyl LP. Bleep. An important artefact in the history of Irish post punk is reissued by Allchival. Previously a member of The Threat, John Stanley aka Stano went solo in 1980, pursuing a path of experimental and improvised music. His debut LP, ‘Content To Write in I Dine Weathercraft’ was released in 1983. Working on it alongside the likes of Michael O'Shea and Roger Doyle, Stano delivers a hypnotic parcel of dark electronic music, challenging the boundaries of rock and minimalism.